Carrie Fisher worries 'Star Wars: The Force Awakens' is "cursed". The 58-year-old actress - who is best known for her portrayal of Princess Leia in the original 'Star Wars' trilogy, and is set to reprise the character in the much-anticipated new film - was involved in her first ever car accident shortly before co-star Harrison Ford survived a small plane crash. She said: "Things happen in threes. I'm about to call Mark Hamill to make sure he's okay. I have a horrid feeling there's a curse going on here. "What is funny is that last Sunday it was raining hard in LA. I was driving to the art store and I got into an accident." 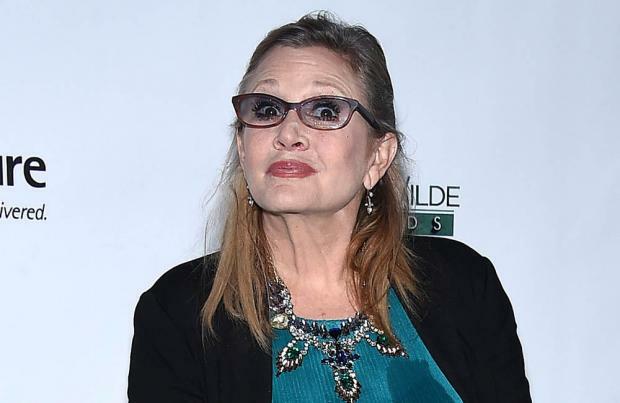 Although the accident was minor, Carrie joked it might be part of a curse that surrounds the movie. She explained to the Mail on Sunday newspaper: "It wasn't that serious and I wasn't hurt but it's the first car accident I've ever had. I drove home and that's when the wheel came off my BMW. "My assistant told me I could have died if the wheel had come off when I was on the freeway. "Then I was watching the news and saw Harrison had his crash. I'm a bit worried it's the curse of Star Wars."